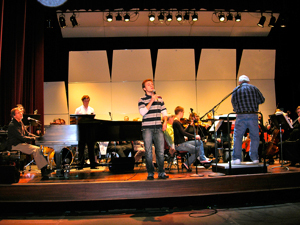 When applicable, one unique feature of Mike’s concerts is he will plan with the presenter about who in their community (student, faculty, local orchestra, school band, or choir) might like to perform as a guest in the concert. This might be an up and coming young vocalist or instrumentalist from one of the local schools or the high school jazz band or choir for example. He will contact that group, or student or person ahead of time and plan a musical piece or two to be performed at the concert. Usually they meet at sound check and rehearse for that evening show. This is a BIG HIT with the audience and a valuable mentoring experience for the participant(s). In the case of a school band or high school or college choir, Mike will work with the local choir director in developing a performance involving the students. Mike’s new song “Music In My Soul” is for a choir, two lead vocalists, and a band (bass, drums, piano) (It’s a kind of rock’n’roll – Billy Joel/Grease/Glee feel) It’s a collaborative effort involving the choir director and of course Mike rehearsing and leading the final performance. The choir can be featured at the beginning and end of Mike’s piano concert. It can be structured in many different ways (high school, college, even middle school) but this is a GREAT concert with a lot of community involvement. Mike invited a talented young vocalist from our local high-school as well as the high-school’s band teacher and talented clarinetist, to guest with him during the concert and I’m in awe how Mike can work with the youth and people of all ages to create a winning atmosphere for all of them. He’s the real deal, and genuine is his passion to make music for all to enjoy. Mike is one of our top engaging performers we have had. For booking please contact us by phone or via the contact page. Copyright © 2019 Mike Strickland Productions. All Rights Reserved.